Pretty Ditty: New aprons and an interview. New aprons and an interview. The new aprons should be up in the Pretty Ditty shop this evening. There may be one more apron to add to the shop, but I can't make any promises. It's been a little criz-naizy (crazy for those of you who aren't fluent in gangsta) around here. Can you believe Christmas is like a month in a half away? 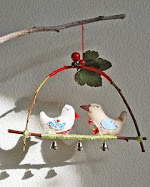 This year I really wanted to make a bunch of handmade gifts for friends and family, but I'm thinking I'm just going to have to buy handmade gifts by way of Etsy. So, before I run off and try to finish one more apron, I did want to tell you to go check out the True Up blog. There is an interview with moi (I believe moi is me in French. Although, I've been told certain words mean one thing in Spanish and then came to find out they don't!!!) about Phat Fabric. WOW, that first apron is STUNNING! yaye for pretty aprons and interviews at true up. you're fabulous. Your aprons are just so darn awesome! 2 months away????? It just comes sooooooo fast! 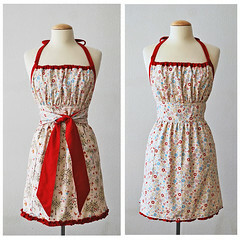 By chance I ended up finding your aprons on Etsy. I have to tell you, they are awesome! I work with textile installations, using a retro 50s theme. Are your aprons from that era or later? Thanks for the quesiton. I love shop talk. Beautiful aprons - you really are so talented! I've been out of the loop for a while and what is this about an interview? Is it still available to check out and where? I answered my own question, never you mind me. Like I said I've been out of the loop and apprently that made me a little loopy. Congrats on that interview! I really like your idea of a reversible apron. You Smarty! 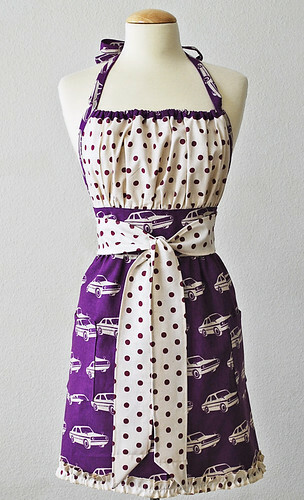 i love love love this apron - would it be okay to feature this on my blog? thanks! I know this may be embarrassing (my level of skill in comparison to yours) but you inspired me. Look what I did. Last picture on the current post. 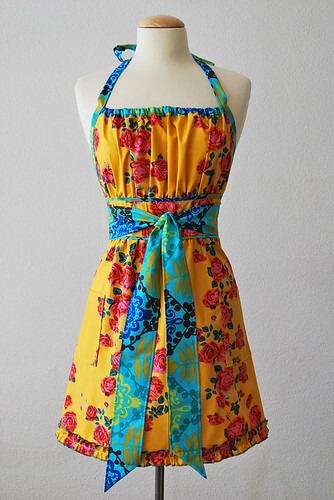 I would be the hostess with the mostess in one of thise gorgeous aprons! I'd LOVE to have one of these as a full skirt - dress. Have you ever thought of making them into dresses? Is it something I could special order?